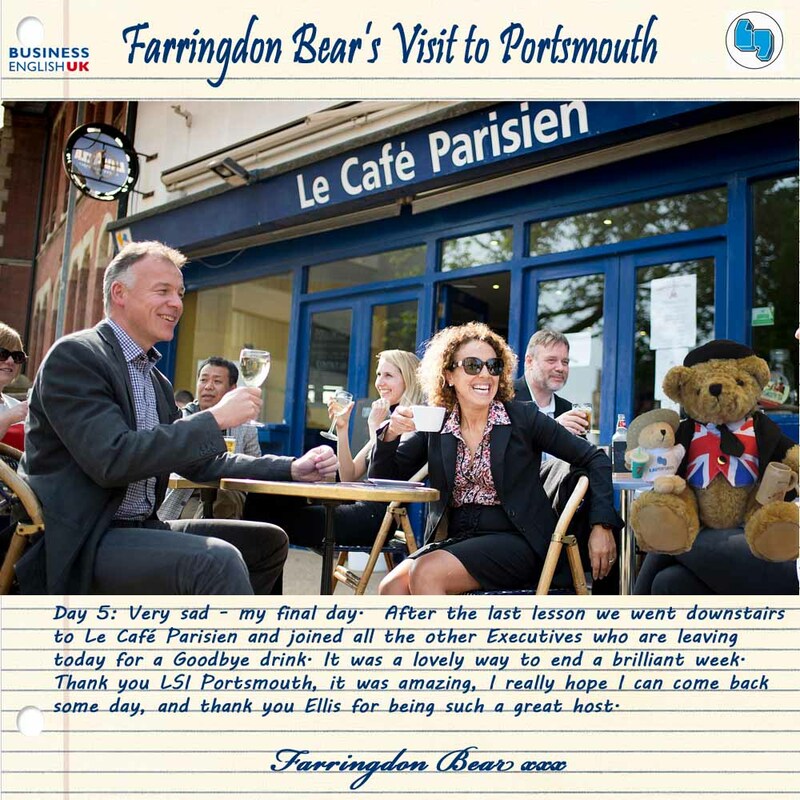 Very sad that this is the last day of Farringdon's visit. We have really enjoyed having him here and showing him our excellent school and city. Day Four of Farringdon's Visit to LSI Portsmouth. Lovely time in the Exec centre and then out for a meal and then some music with Lea Brophy the Vice Principal. 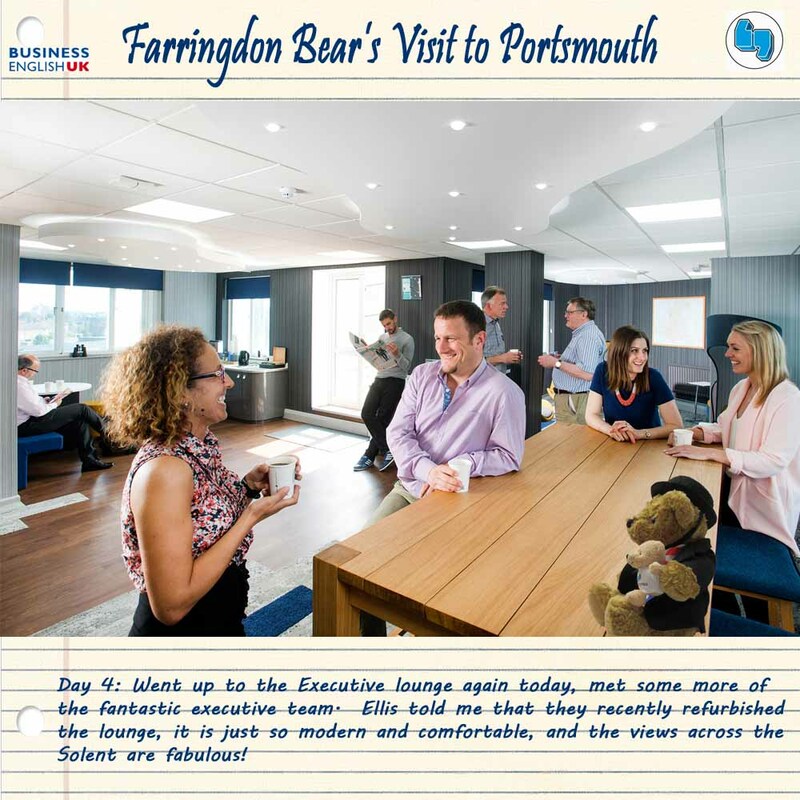 Day three of Farringdon's visit to LSI Portsmouth. A packed day today, sight seeing and sport as well. 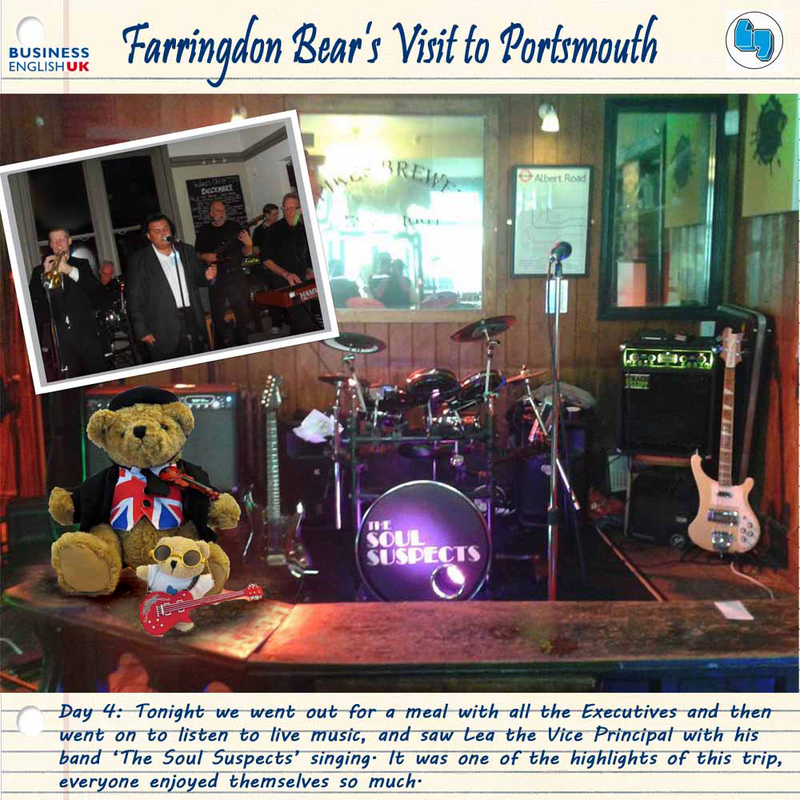 Farringdon's second day in LSI Portsmouth. 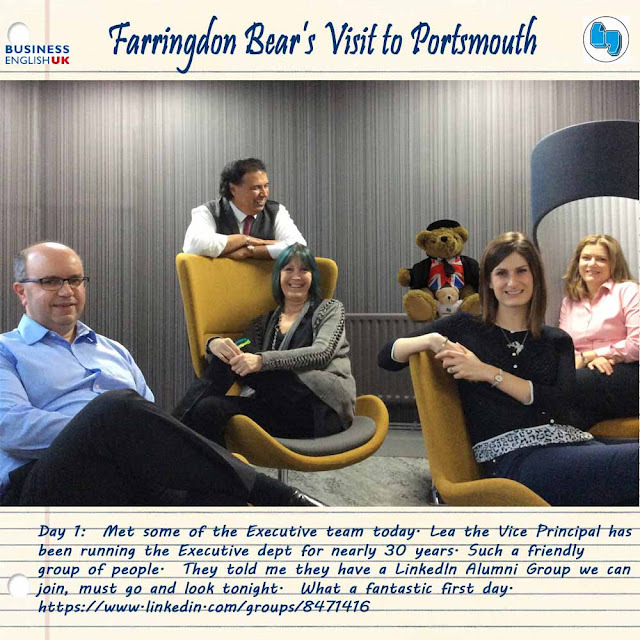 We have a very special visitor this week at LSI Portsmouth - Farringdon Bear from BEUK (See below). As always we love having visitors and so we are going to show him a fabulous time in this amazing city we live in and of course extend the biggest welcome to him from our stunning school and particularly from the Executive Centre. Emma met him and had a little chat with him to explain what makes us so good. This weekend is the America’s Cup! 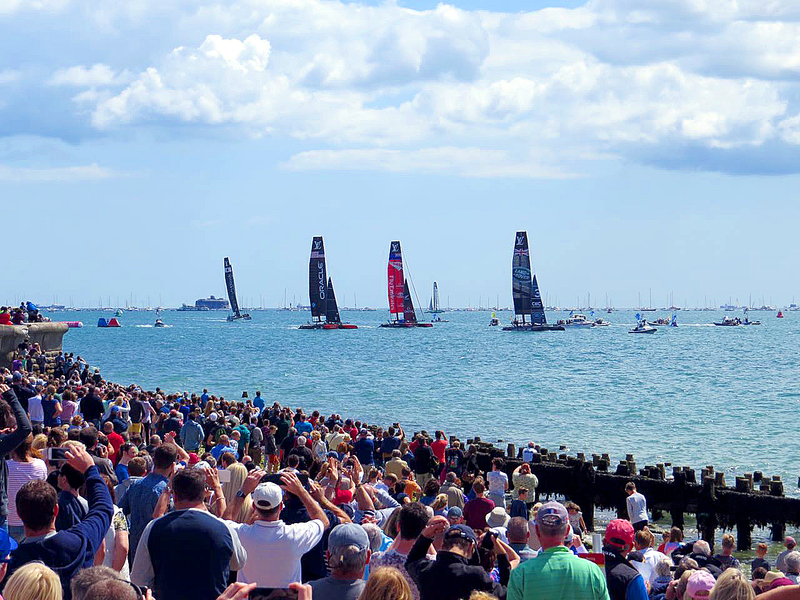 This weekend Portsmouth is hosting the America’s Cup along the seafront, so we’ve answered all the questions you might have about the event. The forecast says that we will have more beautiful weather later in the week, and we highly recommend you go down at some point over the weekend to join in with all the fun! 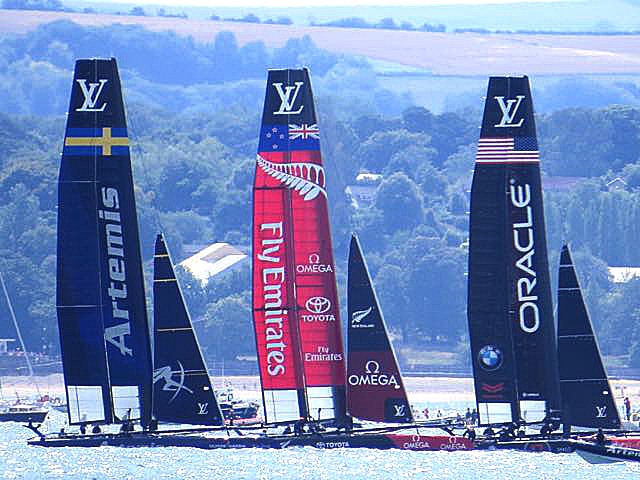 Six international teams made up of elite sailors, are set to compete in the America's Cup World Series in Portsmouth. They use high-speed and technologically-advanced carbon-fiber catamarans. 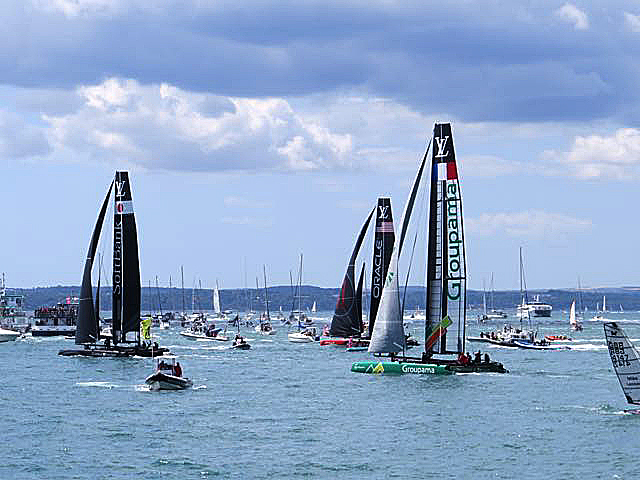 The racing circuit has been held around the world since 2015 and will finish in 2017 in Bermuda. Portsmouth also held the America’s Cup last year in July, but many of the races were cancelled due to terrible weather. We are in England after all! When is the America’s Cup? It’s this weekend, on Friday, Saturday and Sunday. The event starts at 10.00am each day! To enter the actual race village you will need a ticket, which costs £25 for the day. However, there is lots of action happening down the waterfront, and the atmosphere will be amazing, so it’s worth heading down just to check it out. There will be incredible aerial displays every day from 12.00 pm, plus lots of other amazing things to see and do within the race village. We will certainly be buying a ticket and spending the day there, it's a guaranteed amazing time! Prince William and Kate meeting the sailors at the race village. Recently we had the lovely Fabian from Switzerland come and study with us. Just before he left he made this amazing video for us, showing how his student day went. We asked him to tell us a little bit about himself, why he needed to speak English fluently, why he wanted to learn English in the UK and how his English course in England helped him with his job. "My name is Fabian, I am 24, and I come from Zurich in Switzerland. I work as a journalist for a Swiss TV-Channel, and also sometimes on a radio station. 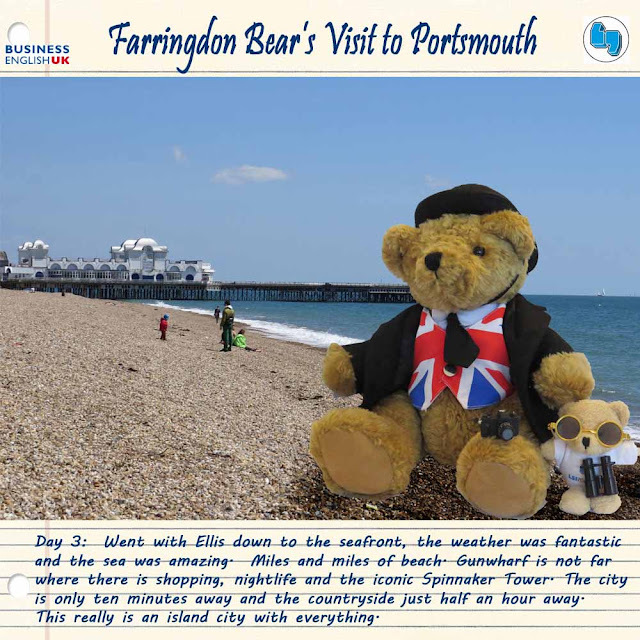 My job was part of the reason why I came to Portsmouth so I could improve my English. I've stayed for about two month and I've had a brilliant time in Pompey. I've met a lot of people from all over the world and had a great time with them. I liked the school a lot! I've had cool teachers who made learning entertaining." Thank you so much Fabian. What Do Reading IELTS Tests Consist Of? Before beginning your IELTS exam preparation, it is important to understand that there are two different types of IELTS test and each has a different type of IELTS reading section. The first is the General IELTS and the second is the Academic IELTS. Both reading tests will give you 40 questions, 3 reading sections and 1 hour to complete the test (which means 20 minutes for each section). Academic IELTS is the most popular of the two, it is typically taken by students who need an IELTS certificate to study at university, it is also sometimes used by learners who need it for employment purposes.The Academic IELTS reading test is characterized by being more heavy-going, it consists of 3 texts, which deal with issues which are recognisably appropriate for test takers entering undergraduate or postgraduate courses or seeking professional registration. What does that mean? The 3 texts will be on academic topics. General IELTS is classically needed by students for the purposes of immigration. A classic example is the band 7 that test takers need in order to emigrate to Australia, with even quite a few native speakers taking the test for this purpose. are not as formidable as the Academic texts, they feature lighter vocabulary, and less text to read. The third section, is the same as one of the Academic IELTS reading sections, it is an Academic text. Therefore, if you learn English on an IELTS preparation course, it will certainly help a learner preparing for the General test to do some Academic reading tests. Therefore, we suggest choosing your English exam preparation material according to the test you intend to take, either General or Academic. 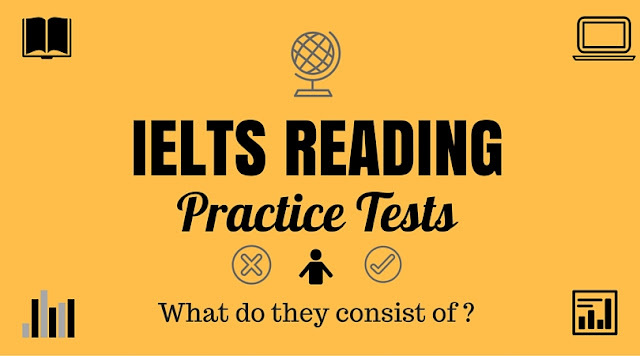 Although very often IELTS reading practice tests will come with both types of test included. Match the correct heading, from a list of possible titles, to the correct paragraph. Classify a statement as either: True, False, Not given / Yes, No, Not given according to the text. Choose the correct word(s) and or numbers from the text to fill the gaps in a summary. The summary could be of the whole text, or a paragraph within the text. Choose the correct answer to a question or ending to a sentence from a list of multiple choice possibilities. Fill in the gaps in a table using the correct word(s) and or numbers from the text. Fill in the gaps in a flow chart using the correct word(s) and or numbers from the text. Label a diagram using the correct word(s) and or numbers from the text. This is not an exhaustive list of question types, however these are the most frequently occurring. Many other question types are simply variations of those listed above. Make sure that you read the question carefully, many students trip up in the test because they do not pay attention to the task they should be doing. Take the two questions below for example, what is the difference between them? Clearly it can be seen that with example B, a student who wrote two words would fail the task. Always read the question carefully, they vary from task to task and exam to exam. The reading test is marked by humans, not a computer, and these markers must be certified examiners. They are regularly monitored by Cambridge to ensure that the IELTS standards are upheld. The General reading test marks can be translated differently to the Academic reading test. Therefore, whatever English exam preparation material you use, make sure you convert your mark into a band score using the correct calculator. Band score calculators can be found very easily by simply Googling ‘band score calculator’ once you have finished a practice test and want to know what the mark you finish with means as a band score. Writing in the style of a magazine article part two - from our students. 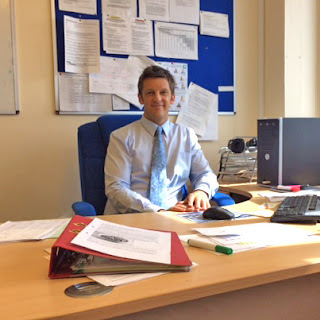 Our mission for today was an interview with ‘Ross the boss’ who is a teacher and a manager at LSI Portsmouth. 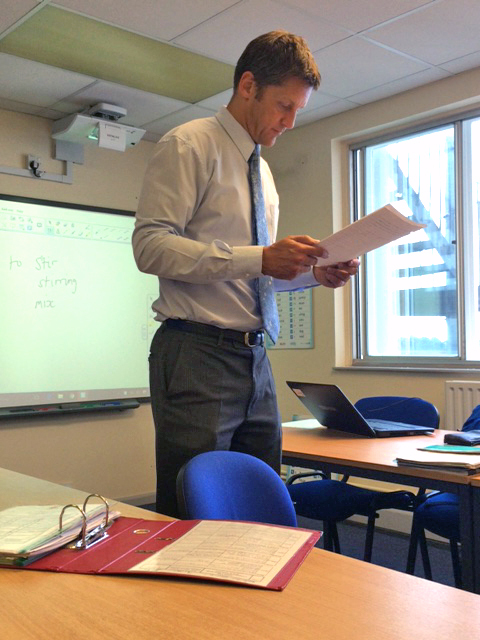 Deciding to do this interview in a classroom, we leave his office to find a suitable room. Ross looks relaxed, answering clearly every question. Fidgeting with his hand he tells us about his childhood. “I grew up happily in Hong Kong, I learnt how to be independent with a life full of sports and fun”. “Because of my father’s job I was always able to live at the university sports centre during the holidays”. Having a vivid memory of playing table tennis, badminton, eating noodles in a canteen, and going swimming with his friends, he talks about his life enthusiastically, realizing how lucky he was. Some of his friends at that time were English, Australian, European but occasionally Chinese. Ross went to boarding school in Ireland. “It was a kind of prison but in fact I quite enjoyed that “. So it seems that school shaped the person the Ross is now. Losing his independence Ross followed the rules at school. “It was very cold in the mountains of Dublin, you always had to wear a uniform. We were always cold and hungry”. He told us that his father wanted him to find a job for life, pushing Ross to study engineering. “After two months starting my engineering course I realized that I had made a terrible mistake”. For the third year of his studies he went to France as a part of his degree. Finishing his university he knew that engineering was not for him. So he got a job which gave him the chance to travel to other countries like Japan. Ross started to speak about his family smiling broadly showing us how much he loves them. “I have a different job which is raising my two children, keeping my wife happy”. They do everything as a family and there is no time to be selfish. Asked about having independence in Hong Kong and then losing it to school and later to family life, he replies that “it was a real struggle”. His independence is reflecting onto his children. “I’m probably breaking all the rules about being a parent, I’m always allowing my son to use saws, drills, and hammers”. Starting to teach his little daughter to have her own independence, she always tries to copy her brother. He goes on to say that although he no longer does loads of sport, his family had become his hobby. Ross prefers the beginning of summer and doesn’t like the really short cold winter days. Writing in the style of a magazine article part one - from our students. 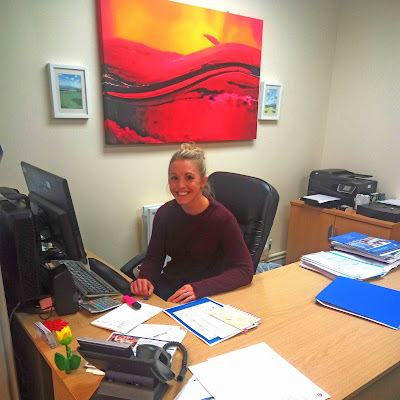 For the last two and a half years, the lovely Rosie has been the 'Director of Operations' for all the “things that happen in the non teaching part of the school”, she tells us. Although she is clearly a really busy woman, she kindly gave us her time for a short interview. We meet her in her office, surrounded by lots of papers and folders. Smiling in a way that makes us feel relaxed, this elegant and sporty woman welcomes us warmly. Starting her career as an events manager, Rosie worked six months for Walt Disney World in Florida, where she learnt how to organise. 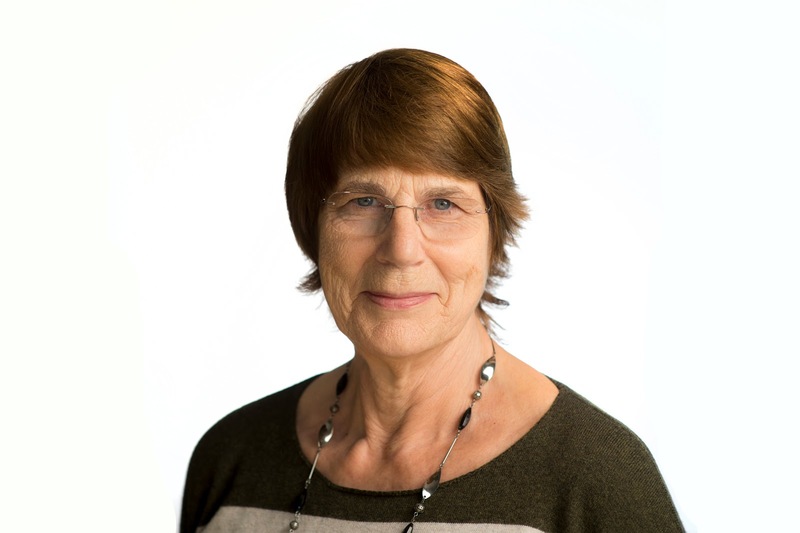 Then she moved to Bristol for five years, working as a registrar where she could implement the theory she learnt when studying public relations in the North of England. All the knowledge she gathered when working in these different jobs has helped her with the logistical side of LSI. However, there is another life besides her job. Asking Rosie what’s important for her, she answers that sport plays an important part in her life. “You will normally see me hobbling around”, she says. Actually she likes playing tennis and doing Boot Camp, which is “really hard but really good”, she mentions. From what she says, Rosie seems to be a very dynamic woman who needs a valve to release her huge reserves of energy. Obviously she found this valve in doing Boot Camp where she gets shouted at while doing her exercise. The other important pillar in her life is her family, like a haven where she can find support coming back from travelling. Writing in English - choosing your style. Writing is nearly always the hardest thing to develop in another language. Recently teacher Jon D's class were focusing on improving their writing skills, and were looking at 'writing in the style of a magazine article'. This week we are publishing a couple of Jon's student's work, because we think it really shows not only superb imagination but also excellence in their ability.